Sometimes it is hard to know what our husbands really need from us. Sure, dinner hot and on the table is nice. A good back rub is great. A nice date night out without the kids is wonderful. But what do they really need? What do their souls most desire from us as wives? 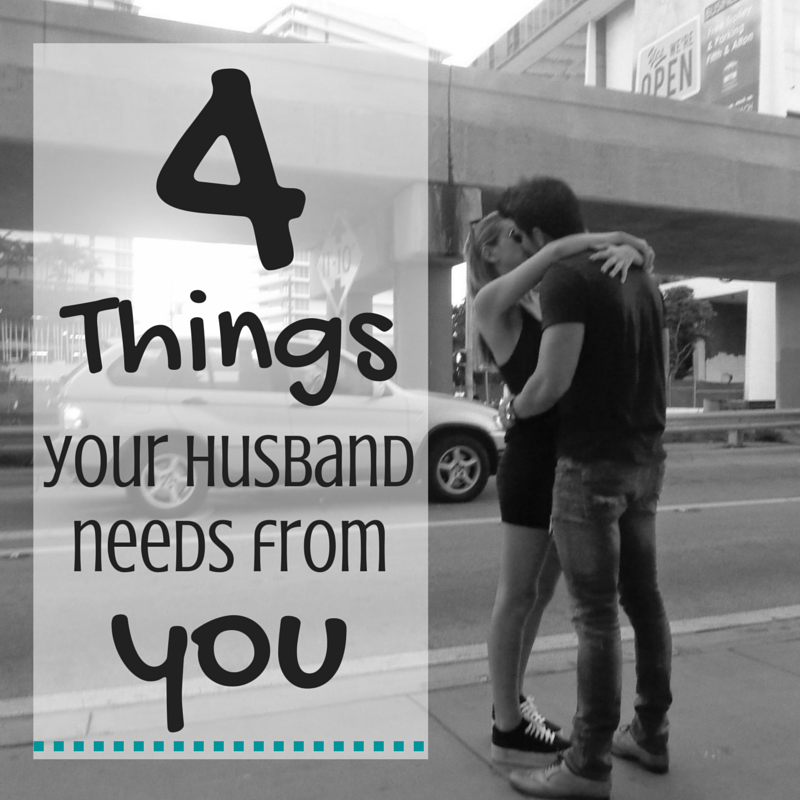 Here are 4 things that your husband needs from you. He needs your support Husbands need their wives support. They need their wives to be their biggest cheerleaders. Our pastor told me this at our wedding and I have heard it a thousand times since then. The whole world is going to cut him down, telling him he isn't good enough, he doesn't work hard enough, he isn't fit enough, strong enough, manly enough. He needs to be able to come home and have you there as his biggest supporter. Telling him he IS all of those things and reminding him of all of his good qualities and who he is in Christ. He needs you to support his ideas when they aren't popular or valued. He needs you to listen to his dreams I am married to a dreamer, friends. One with big ideas that will probably never happen. I will be honest and tell you that for many years, I didn't see the point of talking about these big dreams. I know that I said to him on more than one occasion "Well, you aren't going to actually pursue this, right? So why are we even talking about it?" Ouch. Maybe you have said that or think that even now. But men are just dreamers! They like to think about what big things could come into fruition. They like to dream about the companies they could start and the adventures they could go on. Let him! Let him dream about it and even dream with him. Ask him questions about that million dollar idea he has, let him sketch you a picture of the giant piece of furniture he will never actually build. Just let him dream and never criticize him for doing it! My guy's latest dream is opening our own donut shop, and let's be real--I super hope this one plays out. Yum. He needs your respect Men need respect the way that we need love. It is hard for women to fully understand that, I think. It is hard because we can't relate to it. We want L-O-V-E and lots of it, pleaseandthankyou! That's how your man feels about being respected. He needs to know that you respect him, his ideas, and his decisions. Respect will look different for each man, so ask him how he feels most respected and disrespected. Take good notes! He needs your prayers Prayer is powerful. While sometimes we may think that men have it so easy, they really don't. They have a lot of weight on their shoulders that they carry for their families, co-workers, work places, churches, and friends. They make a lot of decisions each and every day and those decisions aren't always supported by important people. He needs you to be faithful in lifting him up to the Lord. He needs you to carry him to the Cross when he may be too drained to carry himself there, or when he is too busy praying for other people to think to pray for himself. I am guilty of praying for my husband often, but not often letting him know. I need to be better about telling him every now and then that I am praying for him. Yes, I do it daily, but I'm sure he would be blessed to know. Here are some more thoughts on praying for your husband. What else do you think husbands need from their wives?